The Star Tribune recently covered the start of construction on the Norman and Evangeline Hagfors Center for Science, Business, and Religion — Augsburg College’s much anticipated interdisciplinary academic building scheduled to open in January 2018. The article notes that the capital campaign for this building project was the most successful in the College’s history and so far has generated $54 million, which is eight times more than Augsburg has ever raised. The story also acknowledges the generosity of the building’s lead donors, describing Norm Hagfor’s career success and the decades-long connection the Hagfors family developed with Augsburg. 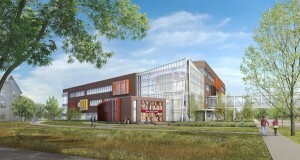 Read Augsburg College starts construction on business-science-religion complex on the Star Tribune website. MINNEAPOLIS — Groundbreaking for Augsburg College’s state-of-the-art, interdisciplinary Norman and Evangeline Hagfors Center for Science, Business and Religion is Friday. 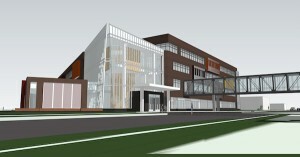 More than 350 alumni, faculty, students, donors and friends of the College are expected to celebrate the groundbreaking for the Hagfors Center, designed to foster intersections among areas of study, support active learning, and connect the College to the community. “The Hagfors Center is a living demonstration of the College’s dedication to interdisciplinary student learning, urban placemaking and thoughtful stewardship. Our commitment to equity and intentional diversity – our pledge to prepare students of academic ability to solve the most complex problems of our world – will be on view Saturday when we celebrate the success of students from Minneapolis and Rochester, including a traditional undergraduate class with more than 42 percent students of color,” said Augsburg College President Paul C. Pribbenow. In the 10 years since Pribbenow has led the institution, Augsburg has more than tripled the percentage of persons of color in the full undergraduate student body – growing from 11 percent in 2006 to 33 percent in 2016.